The plan was to visit the Philippines and learn how to scuba dive, get my diving certification there and fulfill my dream of swimming with tropical fishes. That would be the year’s big vacation, in the sense that I was ready to get away from the city I was living in and forget about everything I left behind for a few weeks. I was unsure about how that would work out: at first, I couldn’t think figure out how to plan an itinerary for a country that has about 2000 tropical islands (inhabited), where each one seemed more beautiful and welcoming than the last. 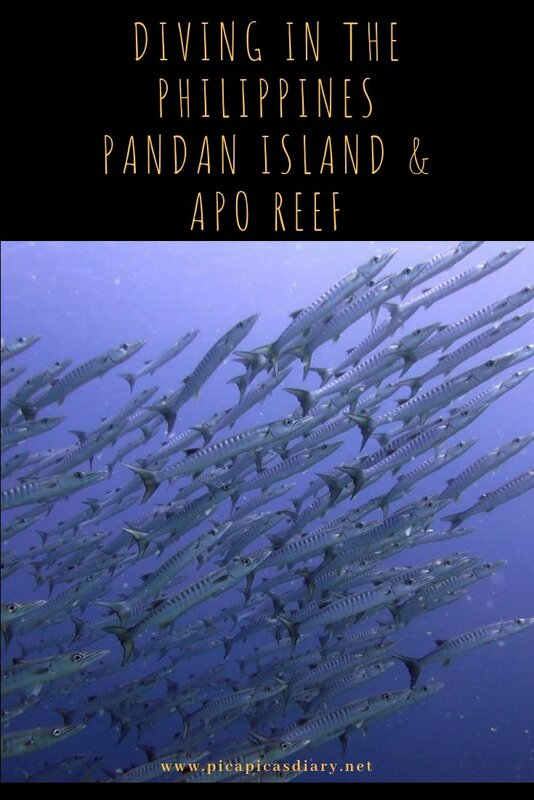 I delved into the paperback guide-book for days, and in the end I felt really attracted to Apo Reef, a diving destination a few hours away by boat from the west coast of Mindoro island. While looking for the best way to get the diving certification which would allow me to dive in Apo Reef, I stumbled across an ad for a diving center on a tiny island called Pandan, situated a short boat ride from Sablayan, a town on the coast of Mindoro. Pandan Island looked just right, but I was afraid that I could not afford it… A small island with only one accomodation and diving center on it… that might be too exclusive and outside of my budget…However, I had a look at the resort’s website, and I was surprised to find out that the price of a “budget hut/room” would be a great deal for me, and very affordable. I booked my stay at Pandan Island Resort for a week, just the time I would need to attend diving classes and visit the reef, and after that, I had in mind to explore a bit more of the Philippines. Pandan Island seemed quite out of the way from other more popular destinations, which could make it complicated to move around to those other places, but somehow I felt that I should go there. There are a few ways to reach Sablayan. I found a cheap flight from Manila to San Jose, from where I could get on a bus to Sablayan, and decided to go for it: I wanted to avoid taking long-hours to commute. Next time (believe me, there will always be a next time in the Philippines), I will plan on taking a ferry; it’s way cheaper and I later discovered that Filipino ferries are conmfortable and reliable, with the only downside being that they might fill up easily. Booking in advance is a must during the weekends and national holidays. Once I reached Sablayan (the doorway to Pandan Island), I took a bancafrom Sablayan’s waterfront (near the market: you can ask for the Emily Hotel and go from there) – it´s easy and costs around 300 pesos (5 euros, or $6 USD) one way in total. Everybody knows about Pandan Island, which is the major attraction in the west part of Mindoro. And then you arrive in paradise. As soon as I stepped on the island, I felt that I had started a very special part of my life. I don’t want to exaggerate here, but how I chose to visit the Philippines and how I found out about Pandan island needs a post of its own – it has a lot to do with synchronicity, it’s like the place somehow drew me to it. One of the reasons why this place is so special is the fact that the resort and all the facilities are the result of the creativity and the synergy of a crew of foreign divers and Filipino locals. This is the place where foreign cultures have been integrated with local traditions, creating a unique dimension that fully won me over and made me want to stay. WHY SHOULD YOU STAY ON PANDAN ISLAND? ITS BEAUTY AND NATURAL SURROUNDINGS WILL LET YOU UNWIND IN A HEALTHY COMPROMISE BETWEEN A FRIENDLY SOCIAL ENVIRONMENT AND A PRIVATE RETREAT White sand, palm trees, crystal-clear water. You sleep a few meters from the sea. You open the windows a bit and the breeze eases your sleep. The huts and other facilities are conceived to have a minimum impact on the natural ecosystem, and you’ll be moved to waste less and to only make use of the essentials. You’ll be able to drink water from the coconuts which grow on the island and spend the day in a hammock looking at the sea, chatting with the locals and other visitors. But you can also take a solitary walk along the untouched beach behind the resort or in the forest and reach two secluded lagoons, spending time alone without feeling completely isolated. At night, the only kiosk-bar on the island is open and board games, darts and pool will remind you how easy it is to have fun in simple ways. You can choose to share cheerful moments with the staff and a few other lucky visitors like yourself, or you may decide to just sit on your beach towel and admire the spectacular night sky. Watch more photos about Pandan on their FB page. Oh!!! The food at the Pandan Island Resort! Eating on Pandan Island couldn’t be more convenient and delicious. The dining hall is in front of the open kitchen which serves freshly baked bread and all kinds of fresh and cooked veggies, pasta and rice, meat and fish, desserts and fresh fruits all in the buffet-dinner format. You’ll be satisfied and full, no matter what. I really came to wait expectantly for 7:30 in the evening, when dinner was served and I got to know what the awesome staff had prepared for us! It’s also possible to order breakfast and lunch dishes a-la-carte at a very convenient price and of good quality. The style of the food? Mixed, and you’ll like it, but it has to be a surprise… you’re gonna look forward to dinner every day, I promise. You can never be certain of meeting nice people in a new place, or that you will feel comfortable in any social environment, and this could also be true for Pandan Island and the visitors you meet there, but there’s one consideration that tips the balance. Pandan Island Resort was born as a family business, what we call “staff” there has lived on the island since they were born, and the family or tribal atmosphere can be felt on many, many levels. There is a harmony which underlies every action and routine. You aren’t only a visitor there, but a guest, and as long as you’re happy to find yourself there, you’ll be sharing a lot with the family. People from Pandan and Sablayan were more than friendly to me. As a female solo traveler, I felt safe and supported: furthermore, the people on Pandan Island showed me how open and radiant Filipino culture is. Among countless interesting conversations and laughter, I’ve learned how much I had been starving for a laid-back atmosphere and cheerful connections. I felt at home to the extent that I spent three weeks on Pandan Island, when I had originally planned to be there for only 6 nights! I visited Coron because I thought it was a pity to miss out on other destinations apart from Pandan and Sablayan, but after hanging out in Coron for a few days, I decided to go back to Pandan and spend more time there. After all, why should I go to other places when I’d found somewhere I like so much? Mariposa’s diving center on Pandan Island has been operating for decades and teaches how to dive, providing up to a Divemaster certification, and offering day trips to Apo Reef featuring three dives and lunch on board. I warmly recommend that you learn how to dive there. The center is cozy, located approximately ten steps from your hut, with a small library with books about diving and fishes, top quality gear and teachers, and a Wifi access with tables and benches. 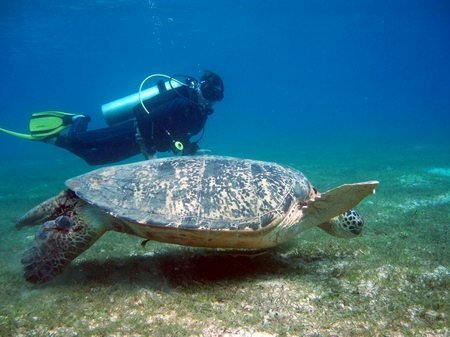 The diving spots around the island are perfect for learning and exercising, and you can actually get to see groups of sea turtles, even if you´re just snorkeling. There are hundreds of reviews about Apo Reef. I was looking forward to diving there, but, since that was my first dive without my usual teacher, I was a bit distressed. We started descending and the visibility was extremely good. In a couple of minutes I was literally surrounded by fish of every shape, size and color and I spotted schools of sharks and barracudas without having to wait very long. It was such a surprising, mind-blowing experience for me, that I had to hold the dive master´s arm to make sure I was still awake and not dreaming. I’m not an expert diver, but the dives in Apo Reef went far beyond my expectations! Hi! I have found your article very interesting and the photos great. I agree your surprise about what you got with your arriving in Philippines. When we travel and visit a place, often what we get is more than what we could have thought. Yes, Mayad, that’s exactly what happened to me 🙂 thanks! After reading your post I’d like booking the plane immediately. The color of the water in your photo is spectacular! Pandan Island really sounds like paradise. A beautiful place to get away from it all! I’d love to go one day! I am envious that you’ve been to all these places. I am from the Philippines and admittedly, I have yet to see Pandan Island. I am happy though that you had a blast & a wonderful experience during your stay. Thank you for all the beautiful words you shared with your readers about fellow Filipinos you had the chance to interact with and about our country. Hope to meet you when you visit again. Wow! This just looks spectacular! I am totally down with more low key vacations and avoiding all the tourist so I will have to check this location out. I need a break from the hectic life! Wow Pandan Island looks amazing! I’m adding this place to my bucket list. Thank you for sharing this! Philippines is good when it terms of beaches and island well. I’m from the Philippines and I’m just wanna say I’m soo proud to post your vacation here in Philippines! I love my country! You know i keep seeing tons of posts about the philippines…. and i am really jonsing to go… however i am afraid if i go i may not come back! Wow! Everything looks so amazing! Would love to visit that dream place!!! This looks like a marvelous place to vacation! Not only is it totally gorgeous but it sounds like the staff makes the vacation worth it with their welcoming energy. I love the synchronicity of people coming together for a wonderful purpose like this. ?? I wish I would have kept a few days aside to explore Apo reef on my last trip to Philippines. It looks magical and just so stunning. Great pictures as well. Hi Prerna! Thank you, Apo Reef is a beautiful day-trip snorkeling, but diving is 100 times better, therefore when you go back there, make sure you will dive in Apo Reef!